While braces do all of the hard work when it comes to providing you with a beautiful smile, it’s up to you help keep your oral hygiene in great condition during the alignment process. The wires and brackets that are used in some orthodontic appliances can easily catch small food particles, and usually impede the use of regular toothbrushes. All of the above can make some areas in the mouth difficult to reach and challenging to keep clean. Keeping gums and teeth clean and bacteria free is essential to your oral health. If you don’t put in the extra effort, you’ll end up developing tooth decay and gum disease, factors that will definitely take the sparkle out of your smile. 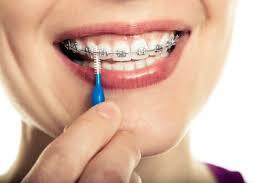 Following are 5 tips for effectively cleaning your teeth while wearing braces. Only use a soft bristled toothbrush that has a small head, and a dab of toothpaste with fluoride as an ingredient. Holding the toothbrush like a pencil, with its head at a 45% angle to the tooth’s surface, move it in an up and down motion, cleaning the teeth all over, front to back, top to bottom. When cleaning the front surface, be sure you brush above and below the brackets. Clean your entire mouth, including your tongue. Allow yourself plenty of time to perform a thorough cleaning job. A fun way to make sure you make enough time for your teeth is to play a song you like while you brush, listening to the whole thing which should only last two to three minutes. Together with brushing, it is advisable to floss a minimum of once a day for healthy teeth and gums. It’s impossible for a toothbrush to clean the spaces in between the teeth, which is where plaque bacteria thrives. Flossing is especially important if you have braces. Bacteria can cause more problems than tooth decay and gum disease; it can cause white spots on the teeth and cause gum tissue to grow over the braces. If you find that your usual dental care tools just isn’t getting the job done, you’ll want to consider investing in better ones. For instance, an Interdental toothbrush which is shaped like a pipe cleaner that has a handle, makes it possible to get around wires and under the brackets, reaching places that a regular brush can’t get to. A floss threader is another handy tool, helping you push the floss safely past obstructions. There’s also unique floss that has a stiffened end, that’s specifically designed for use with braces. A water pick can also come in handy, quickly freeing debris from tiny spaces. You may feel like you put a lot of effort into your oral hygiene, but how do you know that you’re actually doing a good enough job? That’s where a disclosing solution or tablet comes in (available over the counter). This hand oral hygiene aid, made with safe, non-toxic vegetable dyes, will reveal where your dental care is working and more importantly, where it isn’t. Any of the areas you’ve missed will be brightly colored, but don’t worry – it’s temporary dye. Sure, properly maintaining your oral health while wearing braces can be challenging, but when your braces come off, your efforts will produce fantastic results, including a beautiful smile.